This one got past me at first, but it made a great Valentine’s Day gift from my sweetie. Kamishibai is Japanese paper theater – a mysterious 1930s phenomenon that peaked mid-century whereby a storyteller would wheel his pushcart to a convenient park, ring the bell or clack the hiyogoshi sticks a few times to gather a crowd of kids, sell homemade candy, and tell an exciting story illustrated with lurid handpainted drawings. 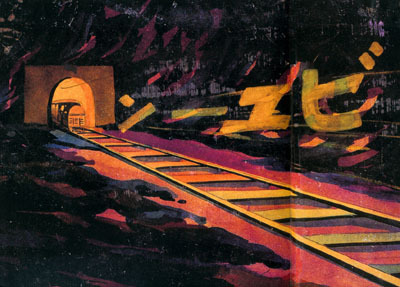 Half prehistoric proto-gekiga, half addled carnival sideshow art, the kamishibai paintings vibrate with pulpy, unstoppable energy as giant monsters battle skull-faced heroes and weeping atom bomb survivors escape derailed trains. 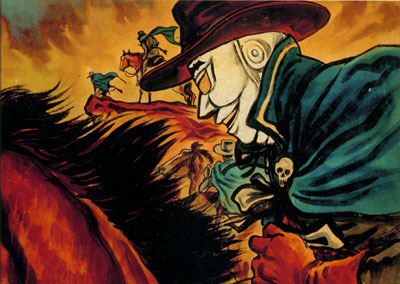 Gangsters battle spacemen and masked cowboys as underpaid, overworked kamishibai artists whip out painting after painting in a fast, cheap, out of control frenzy. This is (or ought to be) the real Japan; not some computerized plastic mass-produced robot, but red-faced, hollering, crazy, hand-crafted, one of a kind fury. I saw the figure BYIIIIN in gold. 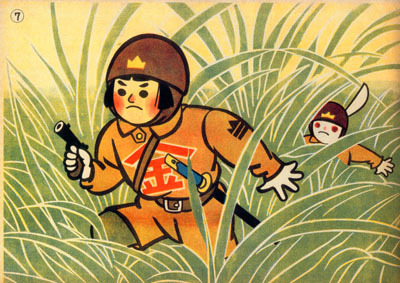 During wartime, government-scripted kamishibai highlighted exploits of the Emperor’s army as it defended the Greater East Asian Co-Prosperity Sphere. Civilians were instructed via paper-theater on proper civil defense against the Bi Ni Ju Ku and its Electronic Incendiary Bombs. 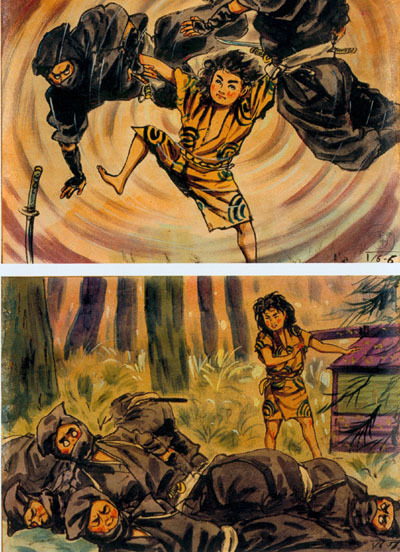 Occupation Japan’s kamishibai had to follow a whole new set of rules designed to repress the fighting spirit, but like Code-stricken American comics, stories merely shifted to fairy tales, spooky fantasy, westerns, and crimefighters. Television dealt kamishibai its death blow – when you can see Golden Bat on your TV set at home, why go to the park? 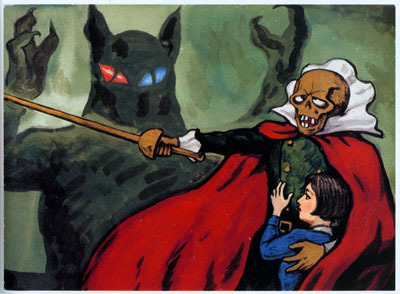 Even a kamishibai Batman couldn’t save the medium. Kintaro and animal chums fight the evil colonialists. Today a few remaining kamishibai ply their trade as a historical re-enactment of sorts, a cultural touchstone in a Japan that embraces the past as strongly as it dreams of the future. As the Showa Era becomes the idealized past of a generation, the paper theater remains alongside teetering Asakasa amusement parks and caged fighting beetles as signposts of pop culture childhood history. 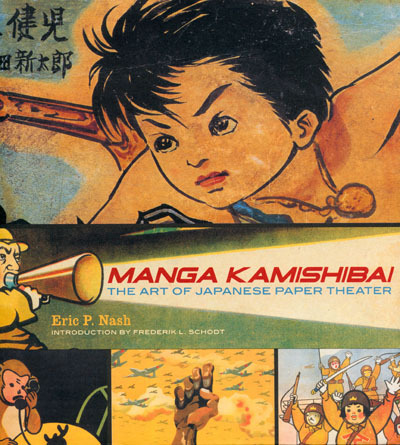 Nash’s MANGA KAMISHIBAI book is a big hefty full-color cultural treasure, filled with detailed reproductions of kamishibai paintings in all their rollicking glory. 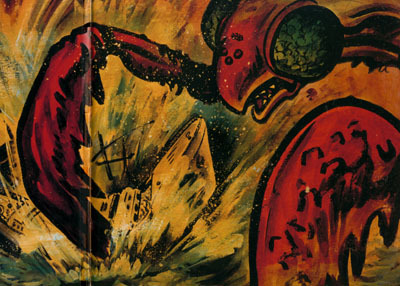 As a cultural institution and as a uniquely Japanese entertainment medium kamishibai deserves study, but this book is worth the price of admission for the paintings alone, hundreds of lurid folk-art monsters, aliens, cowboys, commandos, ninjas, junior G-men, Jungle Boys, all vividly rendered with fat strokes of ink and paint. The dust jacket unfolds into a giant Golden Bat poster. Bonus! Golden Bat should visit an optician sometime soon. Why don’t you already own this book? Is it because you’re afraid to learn manga superstars like Kazuo “Lone Wolf & Cub” Koike and Shigeru “Ge Ge Ge No Kitaro” Mizuki got their start in kamishibai? Fearful of the furious raging Japanese id that lurks beneath the serene salaryman exterior? Too much of a scaredy-cat to let the raw power of these images into your skull? I though so. Well, don’t be a wuss all your life – get out there and get MANGA KAMISHIBAI today!